70km from the KKH the jeep road terminates at the Shrine of Baba Ghundi. 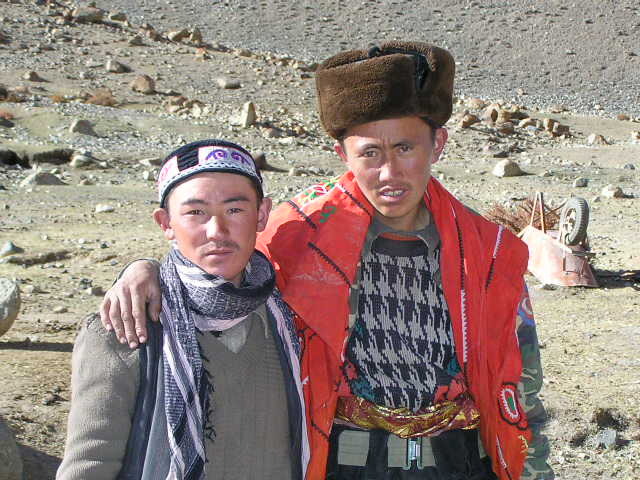 It's here that the Kyrgyz come to trade their wares with the local Pakistanis. 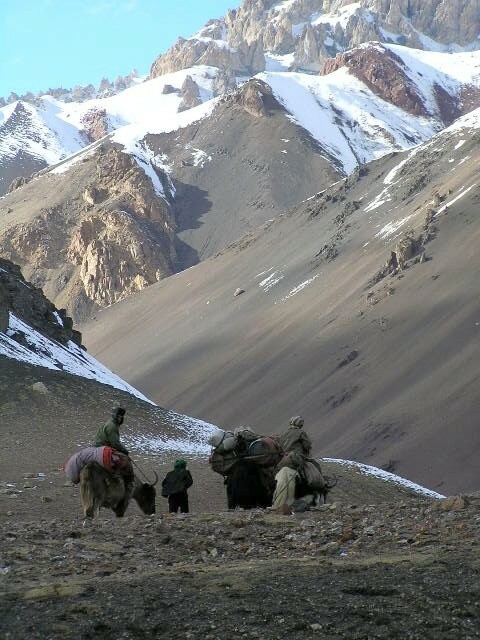 It takes a day from Baba Ghundi to trek with the yaks to the Afghanistan border through striking scenery. The Kyrgyz trek over the high passes with their yaks laden with yak cheese and yak butter stuffed inside stinking yak stomachs. Sheep and goats are also driven across the passes to sell and bartar in exchange for flour, buscuits and other goodies such as short wave radios. Heading home through desolate but stunning scenery just before the Irshad Pass. I'd heard about the Kyrgyz freely travelling across the border trading like they have done for hundreds of years from several travelers on my way up the KKH. 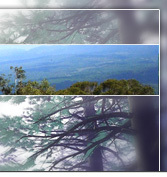 All who came here and saw raved about the place, likening it to traveling back in time. But it's only in recent history that borders have been closed to the white man. Many countries around this part of the world have open borders and all but the white guy can cross freely. Saying this the movements of the Kyrgyz are monitored by local police and military in Baba Ghundi with such troubled lands nearby. 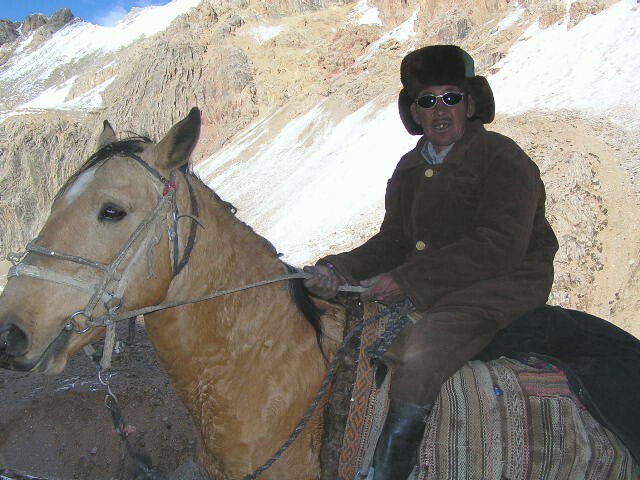 Kyrgyz with the luxury of a horse. 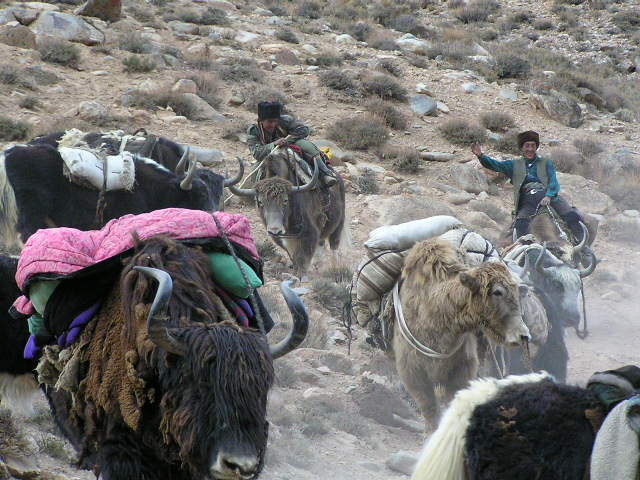 Most tend to ride ragged and smelly yaks. 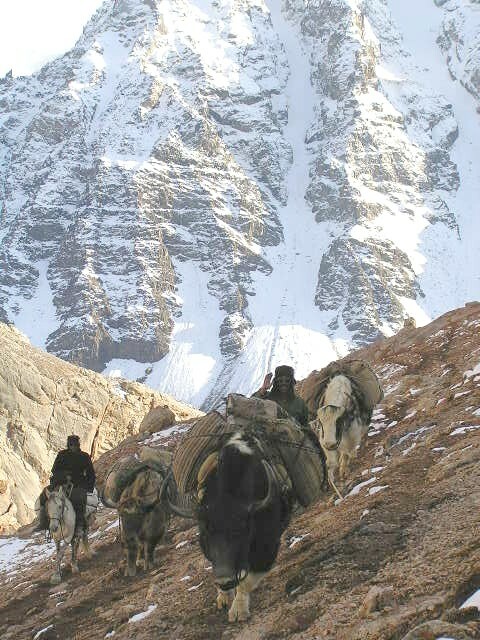 The Kyrgyz travel from the Afghani Whakan corridor. This coridor is about 50km wide and like a finger pointing from Afghanistan to China. On the north side are the Whakan mountains and the south side the Pamirs. The corridor was designated to Afghanistan by the Russians and the English in the early 1900's to provide a buffer zone between themselves. 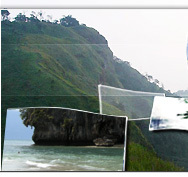 At that time they was a lot of tension between the two countries, both after control in these areas. Secret agents were mapping the topography and the great powers played out the great game. Kyrgyz giving a show for the camera....ride em cowboy! The Kyrgyz hang about in a few rough shod stone huts in Baba Ghundi or usually just doss on the ground wrapped up under a mound of blankets even in the cold and snow. For now at least they are a friendly bunch, greeting, waving and smiling to me and the few other travelers who pass through here. 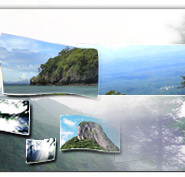 It's good here to be seen as a tourist attraction myself. The Chapursan valley is still an infant in tourist terms and the Kyrgyz seem to delight in seeing the trickle of strange breeds reaching here. They stop and stare as we white sorts walk by. Some dressed in wrags and local clothing, others with the latest in trekking equipment, one Spanish guy dressed as a Taliban and myself on my 27speed mountain bike. I'd love to listen into their conversations to see what they think of us and to try and understand their way of life just a little better. In the Kyrgyz camp at Baba Ghundi. There were already several caravans of Kyrgyz in the Baba Ghundi camp when I arrived and more arrived over the next few days, staying until the weather lifted. I loved to check out the yaks, most of which I'm told aren't actually yaks but infact cross breeds. 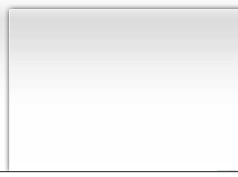 I guess the mammoth looking ones were the yaks. Whichever is which they all are smelly and skanky. The Kyrgyz use these ones as transport and nothing else, no maintainence on these at all, rather like the local busses I guess. A face that can tell a thousand stories. 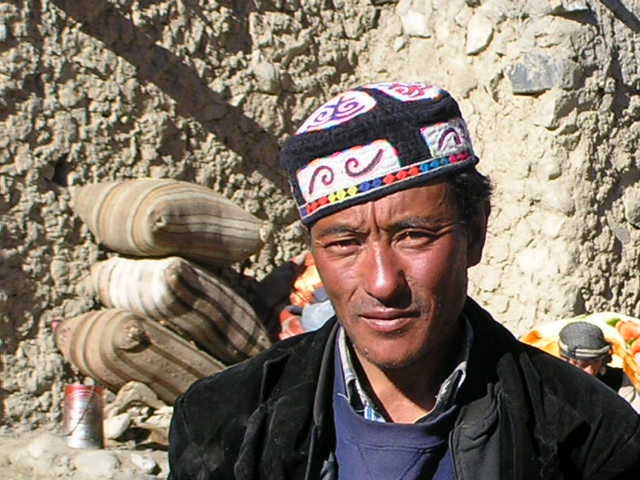 No two Kyrgyz faces are even remotely the same. They are all coming from the Afghanistan Whakan corridor. Historically it's a meeting point of many peoples, Pakistanis, Tajiks, Kyrgyz, Chinese, Uigurs and other groups including several marauding armies. In the past 20 years the areas has seen much conflict and much movement as the locals flee from one war to another. When I meet the caravans on the trails I play the tourist and take out my camera and ask permission before shooting and pikkies. 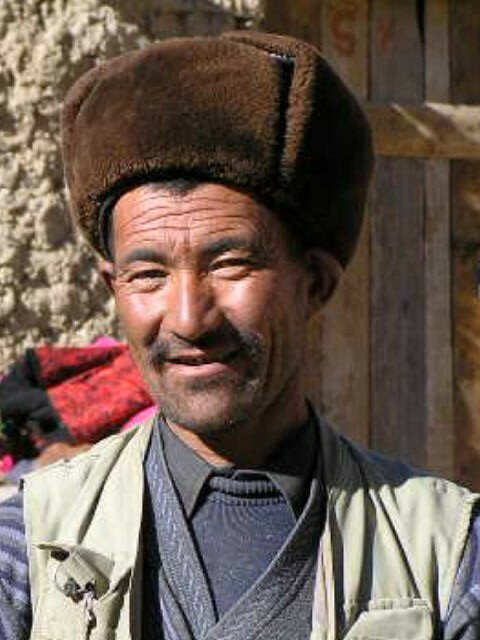 But they Kyrgyz love to be photographed and always play and pose to to camera. They'll stop and pose or scream and shout and even once picked up big rocks and lauched them at the yaks while screaming and shouting at them. I almost felt guilty for taking out my camera....especially since the photos were pretty bad.